One of the universal aspects of humanity is the wearing of clothes. Even in cultures which developed in climates where clothing would seem optional, such as the tropics, clothing is used to distinguish social standing and for nearly universal concepts of modesty. Clothing was first developed as protection from the environment, in warm climates bare skin would be covered to protect it from the damaging effects of sun and wind while in colder areas covering the skin provides insulation, allowing the wearer to make better use of calories consumed to hunt, provide protection, build structures or travel rather than burning all that food energy in a struggle to stay warm. The earliest clothes were fashioned from broad leaves, and later from the skins of animals killed in the hunt. 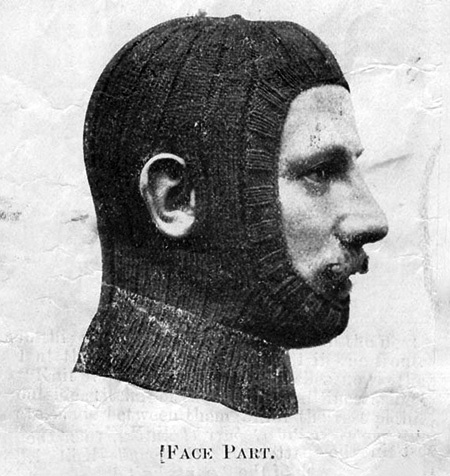 Unfortunately, even if a single leaf or skin was large enough to cover the wearer's body it probably was the wrong shape to be a practical garment. Stone knives would have been used to cut to shape and then the skins or leaves were bound together with threads made from animal sinew or plant vines. At first, the thread would have been pushed through holes cut with primitive awls but one of the first technological revolutions would have been the use of bone needles with an eye to pull the thread. Eventually, humans learned to spin animal fur and plant fibers into threads which were woven into primitive cloth. Anthropologists say that shepherds learned to not only spin the hair from their flocks but discovered ways to knot the yarns to invent knitting. 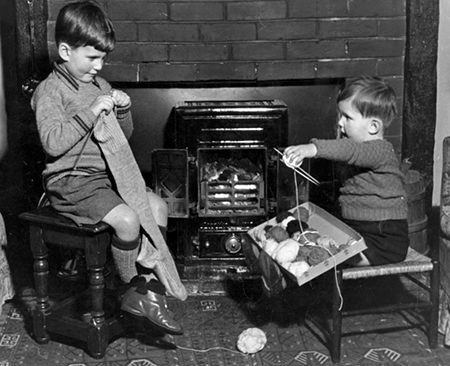 Although knitting was developed by shepherds, one of the earliest and most enduring examples of "women's work" was the sewing and mending of clothes while hunting and tending flocks became masculine pursuits. The benefits of knitting and the benefits of listening to old time radio programs are not dissimilar, but they manifest themselves is opposite forms. Enjoying a radio drama is something that you can do while your eyes and hands are busy doing other things, like cleaning the house or driving a car. Knitting keeps your eyes and fingers occupied, but once you have established the rhythm of purl and knit stitches, you mind only needs to be occupied to the point of counting the stitches. This means that you can knit while engaging in a conversation, attending a lecture, riding in the car or bus, or even listening to an OTR program. The notion of sewing as "women's work" became so entrenched that game shows like Raising A Husband used men sewing as a comic device. Even more effective to get laughs is a husband like Fibber McGee taking over house cleaning and sewing duties. Of course, men in situations without feminine support, like serving in the Army or onboard ships would have learned skills with needle and thread so they could repair their expensive clothing when it tore in regular use. Even Fibber could sew a button back on his jacket, but what would have taken Molly a few seconds and little thought for Molly becomes an operation on the scale of D-Day for Fibber. The quiz show Raising a Husband takes comic advantage of young husband's lack of domestic skills. Of course, any sewing project is a matter of details. A mystery unfolds in the summer of 1946 on Myrt and Marge when an apparent alibi is undone by a button resewn with the wrong color thread. "The Case of the High School Hot Shots" is solved on Gangbusters when the cops discover an incriminating piece of purple sewing thread. Knitting is a productive activity which has so much repetitive motion that it can become a form of meditation. 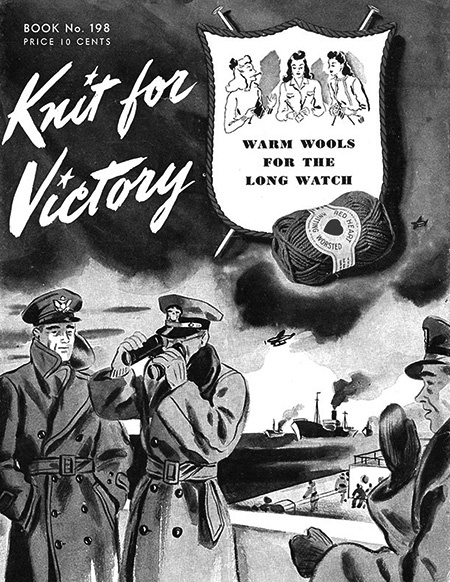 The Rita Murray Show encourages her listeners to take up knitting projects for soldiers in the weeks after Pearl Harbor. A husband and wife sock-knitting competition breaks out on The Adventures of Ozzie and Harriet, and the solution to a Chinatown mystery involving murder and stolen pearls is discovered in the knitting instructions on Sky King. The invention of the sewing machine took some of the mind-numbing repetitiveness out of the sewing process and helped to launch the industrial revolution. Both Jack Benny and Rudy Vallee recall the Gay Nineties with plays about "The Sewing Machine Girl" and her journey from rags to riches. The industrial revolution also made home sewing machines a common part of every housewives' vital equipment. Bob and Ray report a sewing contest held at Madison Square Garden. When Molly's sewing machine needs fixing, Fibber is sure he can handle it, but the results are inevitable. The shows in our knitting collection begin by finding humor in the less that masculine reputation of knitters. Fibber McGee uses his needles and a few balls of gray wool to create the sort of monstrosity that only Fibber McGee would create. Robert Ripley introduces us to the notion that the industrial revolution was sparked by an enterprising young man who wanted his best girl to pay more attention to him. Rita Murray discusses the practical benefits of knitting, but this notion may actually be in dispute. Modern knitters are all too familiar with the situation where they purchase $50 worth of fine, colorful yarn and then spend dozens of hours crafting a scarf or other beautiful item, the whole time realizing that they could buy a scarf that is just as nice for around $10 in the department store. However, this discounts the less tangible benefits of knitting. Medical science points to evidence that keeping your brain occupied with activities like knitting will help to prevent or delay the onset of dementia, it can be a channel for excess energy in youngsters, and provide a relaxing break from all the screens in our increasingly technology-driven digital world. Be the first to comment on "Sewing and Knitting"